Beef rendang is probably one of the most popular Malay curry. I haven't met anyone who does not like this fragrant spicy dried beef curry. Nearly every Malay festive celebrations, there is always rendang of some sort, beef, chicken, lamb, dried or wet rendang. Preparing the rempah or spice paste is important to give maximum flavour. Usiing a mini blender it only takes less than a minute to ground the spices to a smooth paste, so much easier than using pestle and mortar. 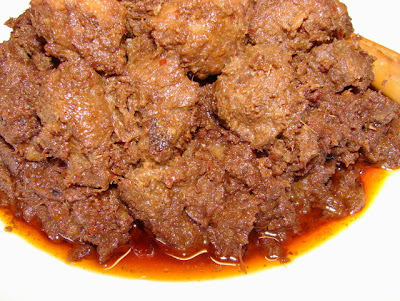 There are quite a few versions of beef rendang. This recipe is one of common type. One of the common ingredient for rendang I can't get over here to make it as authentic as possible is turmeric leaf. Shame but without it, the rendang is still very tasty. Kerisik or ground roasted coconut is essential for most dried rendang, it thickens the sauce and gives a nice caramelised flavour. I have already posted this recipe on BBC food message board ages ago. I have several requests to post it on the blog so here it is. 1/2 cup loosely packed kerisik (ground roasted coconut), see this post how to make this. If fresh coconut is not available can used frozen or dessicated coconut. With dessicated coconut, dampen it slightly with couple tbsp of water before dry roasting. Dry roast using a small pan till golden brown and blitz in a blender till very fine. Kerisik is the essential ingredient for dried rendang, don’t leave it out. Ground shallots, garlic, galangal, fresh ginger, candle nuts and chillies using a mini blender till as smooth as possible. Add a touch of water if the paste is dry and difficult to blend. Mix wet spice with dry spice powder. Dust beef pieces with a little flour and fry with some oil at high heat very quickly till lightly golden. Remove into a dish. Stir fry the spice paste with 3 - 6 tbsp cooking oil at medium heat for about 10 - 15 minutes till the spice is very fragrant. Keep stirring to prevent paste burning and sticking to pan or wok. Add coconut milk, beef, tamarind, palm sugar and about 1 cups of water and bring to a boil, lid on and gently simmer for about 1 – 1 1/2 hours or till the meat is tender. Seasoned with enough salt. Remove cardamom, star anise and lemon grass if needed. I don't really bother. Add in the kerisik. If there is still a lot of sauce in the pan/wok, take the meat out using a slotted spoon and reduce the sauce before adding kerisik. After adding the kerisik, continue simmering/ stir frying till oil is separating and beef rendang is quite dry. If you like rendang very rich and creamy, reserve a tbsp or two of a top cream from a tin of coconut milk (don’t shake the tin before open) and stir this coconut cream into the curry before serving. The finish product should be quite dry without much runny gravy. There may be a lot of oil floating on the meat after cooking, skimmed if you prefer. This oil is very good to flavour other curry. ** Candle nuts is available from most chinese or Thai supermarket. They look like macadamia nuts but larger. ** 4 – 5 Srewpipe leaves (pandan), twist into a knot can be added during simmering to add extra flavour. ** Traditional rendang also has turmeric leaf added but I left it out in the recipe because it's not available. **some people like to add few kefir lime leaves to rendang, I never have, but if you preferred add some shredded lime leaves at the end of cooking. I know where I'm coming next time I make Rendang, forget Rick Stein's version, yours won't suffer from the the dull factor! I have never bought or seen fresh Galangal. I reckon it would be much easier for me to find galangal paste in the supermarket. Galangal adds a distinctive, lightly acidic taste to curries. I prefer galangal fresh. They are good to freeze for months. Hi lovely rendang...and lovely colour too. Do you have the recipe to make tom yam sauce from scratch? I made tom yum with whole spices, not paste and add some Thai chilli paste (nam prik pao) to make it looks reddish. If you like the recipe I can post it here.